Apu…have you heard this name? may be…but the “Apu” I am talking about is an internationally famous “Semi imaginary character”…as long as the world of cinema will exist the name will remain with it’s glory. Once upon a time a 32 year old boy decided to make a movie, he liked a novel and decided to made a film on that…the journey was not as easy as I have written here; it was his directorial debut, and a big thanks to God that the wife of the writer (of the novel) allowed the debutante director to make movie on the novel ignoring an established director,who also approached her for the same. The shooting of the movie started 27th October 1952 and completed in 1955. Not only the director but also the cinematographer was newbie in that film. The budget of the film was only 70,000/- but it was tough for them to find a producer, at last Rana Dutta(a Producer) gave money but the shooting stopped after a time coz Rana Dutta’s movies got flopped in the market. Then the director started to work as a graphic designer, he pledged his insurance policies, sold his entire gramophone records and his wife also helped him by pledging her jewelry, still there were shortage of money. A friend of Director’s mother managed to get loan from West Bengal Govt., the chief minister Bidhan Chandra Roy helped for the production of the movie and Govt. sanctioned a loan seeing the footage of the movie, The Home Publicity Department of West Bengal misunderstood the movie and thought it is a documentary on Rural up liftmen and sanctioned the loan as for “Road Improvement”, the title of the movie was itself a reason for such misunderstanding. So, after three years of tough time and various obstacles the film became complete. Casting of the film was also very interesting, one of the lead characters of the movie “Harihar” was played by one of the established film actor named Kanu Bannerjee, “Sarbajaya” the wife of “Harihar” was an amateur theater actress named Karuna Bannejee and the character “Indira Thakrun” was played by Charubala Devi, those days she was living in Kolkata’s red light district, she was an retired stage actress, it was obviously the credit of the director to found her and casting in his movie. Now the time was to find “Apu”…the director gave advertisement in news papers, he was looking for a boy in between of age five to seven, but after lots of interviews with boys not a single boy made him satisfied, coz they did not match with the looks of “Apu” the director already had in his mind, it’s her wife who noticed a boy in their neighborhood and mentioned the director and at last the search became end. The soundtrack of the movie was composed by Pandit Ravishankar who was then at the early stage of his career. There are so many awards and nominations the movie won that can’t be written in this short post, in short, the movie won eleven international prizes and I wanna specially mention…in the year 1999 the movie tied with “The Godfther” and ranked 12th in the category of ‘best Films of the Century” by The Village Voice (American news and culture paper). In the year 2012, The British institute’s magazine ranked the movie 42nd in their list of “Top 50 greatest films of all time:”. The soundtrack also featured in “50 greatest film soundtracks” By The Gurdian in the year 2007. 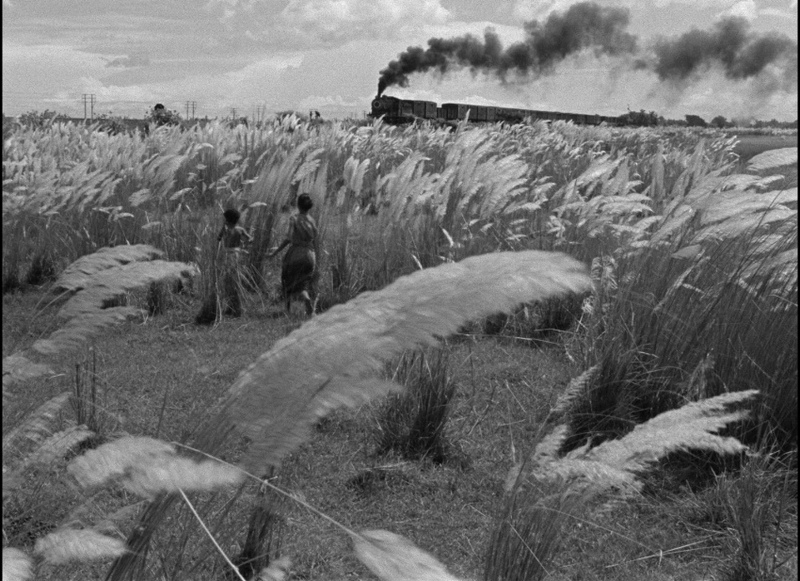 The director was none other than the Great Satyajit Ray and the movie was “Pather Panchali”(Song of the little road). The original novel written by the famous Bengali writer Bibhuti Bhusan Bandyopadhay named “Pather Panchali”, when first time I read this novel the pain remain in my heart for few days and my mind was stunned…how a writer can depict so much pain, agony and sufferings through words!!!! !How can anyone write such a pathetic story…this is the reason they are the great writers. After “Pather Panchali” Mr. Satyajit Ray made two other movies, those are on the life of Apu and these three movies are widely known as “Apu Trilogy” consists of movies…”Pather Panchali”, “Aporajito(The Unbeaten) and “Apur Sansar”(The world of Apu). For details of the “Apu Trilogy” you can Google it and I am sure wikipedia will make you surprised providing the info’s (Especially the awards) about this Trilogy. Apu and Durga running for the glimpse of the train. I doubt hardly any Indian film has ever own so many awards. Now I must clarify why I have mentioned Apu as a “semi-imaginary Character”…coz this novel is actually an autobiographical novel by Bibhutibhusan Bandyopadhyay and this was his first novel.